I'm a little slow in writing about a great movie that opened as I was out of town last week. It's called "Man On Wire" and I had been eagerly awaiting its opening. Watching it was the first thing I did when I got back into town this week. 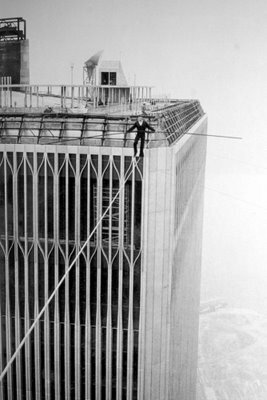 "Man On Wire" is a documentary (directed by James Marsh) about Philippe Petit, a French tightrope artist who rigged a wire between the twin towers of the World Trade Center and made eight crossings over the course of 45 minutes on the morning of August 7, 1974. The movie details the several years leading up to the walk and it features some great footage from two of his other famous tightrope performances: between the towers of the Notre Dame cathedral in Paris (1971) as well as between two towers at the entrance of the Sydney Harbour Bridge (1973). I've been a huge fan of Petit's ever since I bought his book, "To Reach The Clouds" when it came out in 2002. The book gets very detailed about the logistics of how he and his cohorts achieved access to the towers, how they got the wire rigged, etc. It was published six months after 9/11 and so it ends on a more sombre, memorial tone than the movie. 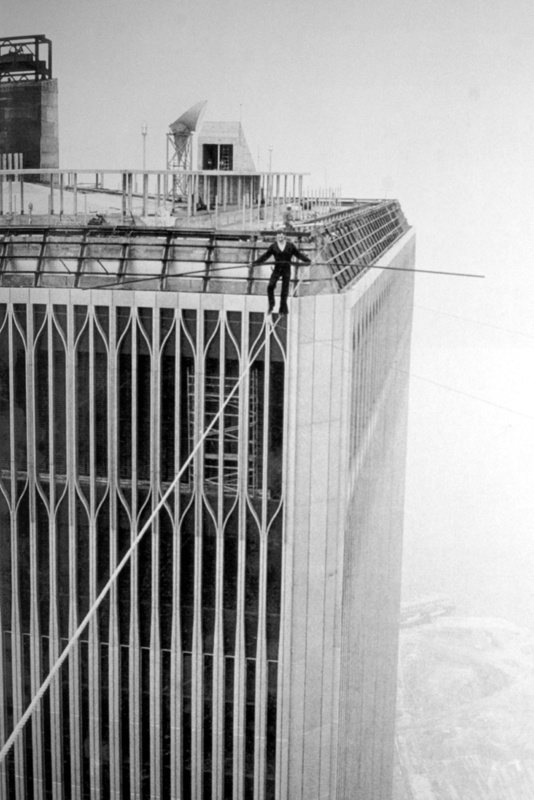 "Man On Wire" has a decidedly more triumphant feel, and 9/11 is never mentioned directly. There are countless reviews of the movie online, but A.O. Scott's review in The New York Times features several clips from the movie (that paper's original report from 1974 can be read here.) 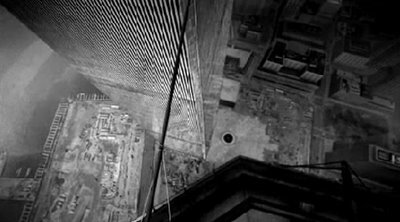 In the Village Voice, Jim Ridley puts it best by saying that Petit's walk across the void between the towers was akin to "staring down the limits of what is humanly possible." It's amazing to think Petit was still a teenager when he came up with the idea, and a week shy of his 25th birthday when he actually performed the walk. In the book, Petit goes into great detail about every aspect of "le coup." One such detail is how Petit, as he was rigging his own wire, noticed that a narrow aluminum working platform hanging several floors down from the top of the building had been hastily rigged and was dangerously loose. So whenever he had an extra minute he would go over to tighten and reinforce the rigging for his "brothers, the aerial construction workers." He writes that the most dangerous aspect of the day was not the tightrope walk itself, but the manner in which the cops shoved him down the stairwell on the way down after he was arrested. With his hands cuffed behind him, he had little control over his balance and on a couple occasions nearly smashed his skull in as he tried to avoid falling. I have many questions for Petit, most of which are technical. For one, if he had somehow gained absolute permission to perform the walk, what would he have done differently? Also, I'd always read that one tower was taller than the other by six feet. I'd like to know if the wire was perfectly parallel with the horizon or if the difference in building heights required it to be rigged at an angle. And if that was necessarily a disadvantage. It started raining minutes after he got off the wire. Would he have continued if it had started to rain before he walked? One question that was asked recently of Petit by Reed Tucker of The New York Post goes as follows: Q) Is it true wire walkers aren't supposed to look down? Petit's reply: "It's a legend. I don't know where it comes from. Maybe it comes from people who are not accustomed to height and think that if you look down, you're more easily assailed by the void. But I am not there by chance - I am there by choice. I live to be there on the roof and look down. It doesn't bother me. It is treacherous on a high wire to change your focus point and suddenly look down. But I wanted, needed to look down. I wanted the joy of remembering where I was to be there for eternity. What I saw is imprinted in my memory and will never be erased."